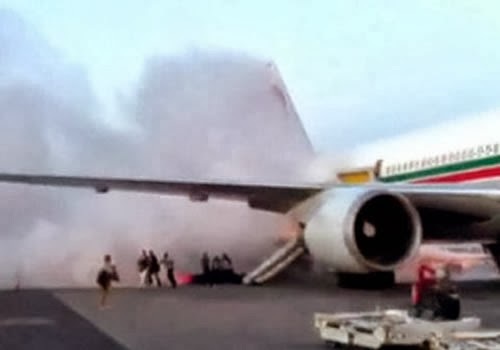 31 passengers, including the son of late Ibadan politician, Lamidi Adedibu, Sen Kamoru Adedibu, escaped death yesterday after an Overland Airlines aircraft they boarded caught fire shortly before take off at the Nnamdi Azikiwe International Airport, Abuja yesterday. Saturday Tribune reports that the plane, scheduled for Ibadan from Abuja at 4:52p.m. was about to take off when it started emitting smoke from one of its engines. One of the passengers who spoke with Saturday Tribune said the about 31 passengers of the plane were already seated before the incident. “We were subsequently evacuated by airport officials. As I am speaking with you now (8:30p.m. ), we are waiting for another plane from Ilorin, which we have been promised will take us to Ibadan. We thank God,” she said. Senator Adedibu described the incident as a horrible experience but thanked God that it did not happen mid-air. He commended the pilot, the crew and airport officials for being observant and for the prompt rescue operation. He also confirmed that all the passengers were still at the Abuja airport at 8:45p.m. when Saturday Tribune spoke with him.